A few years ago on a birding trip in Texas, several of us wanted to see Cave Swallows. Texas is the best place to find them in the U.S. Their range extends into southern Texas from Mexico. There have been a few scattered sightings in other states. Cave Swallows closely resemble a swallow breeding here, Cliff Swallows. We found the Cave Swallows nesting on a concrete bridge spanning a dry stream. The bridge ran north and south. Their nests were on the east side, in deep shade in the afternoon. Perhaps that is cave-like. Cliff Swallows were on the sunny west side. Cave Swallows have a pale throat, Cliff Swallows a dark throat. Cliff Swallows have a much brighter forehead patch than their Texas cousins. Cliff Swallows, the flyer photographed at a barn in Orono, build gourd-shaped nests on a vertical surface topped with something horizontal. You sometimes find them nesting in the large culverts installed in western pastures to allow cattle to move from one side of a road to the other. They are easy to see there. The nests of the two species are similar, gourd-like, made of hundreds of dabs of mud carried by the birds in their bills from wherever. Cliff Swallows are best seen this time of year by checking the swallows perched on power lines as they flock up for migration. 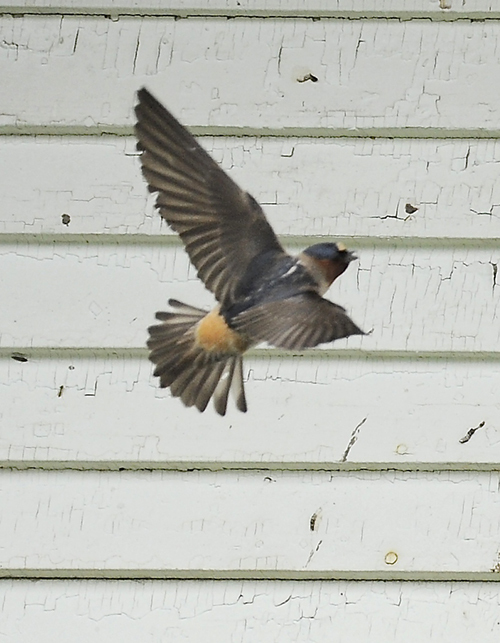 Cliff Swallow heading for its nest on an Orono barn. 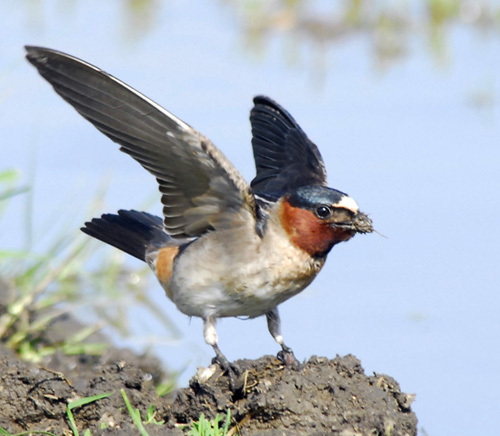 Cliff Swallow with dab of mud for its nest. 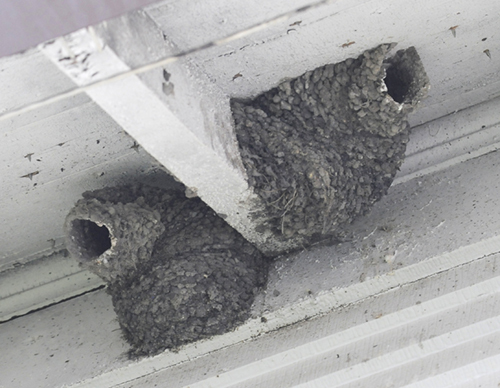 Cliff Swallow nests. The birds made countless mud trips over several days to build these. 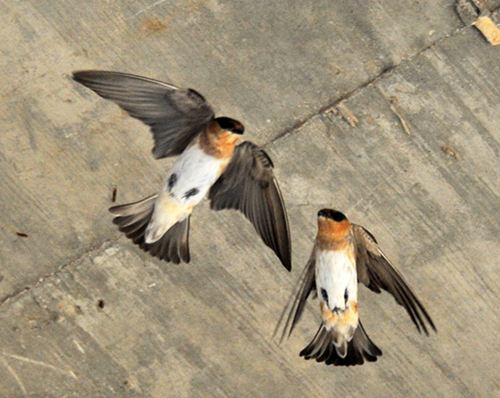 Cave Swallows -- paler throat, darker forehead patch. Don't expect to see them here.